Soon after Supreme Court Justice Antonin Scalia’s death , President Barack Obama began the search to find a suitable replacement to fill Scalia’s seat on the court. However, reports have confirmed that after an extensive search, nobody large enough to fill Scalia’s seat has been found. 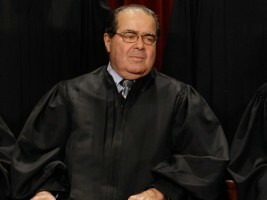 President Ronald Regan appointed Scalia to the court in 1986, and throughout Scalia’s years on the court he played a sizeable role in many influential cases. Finding someone who can fill his role, and his seat, have proven far more challenging than the Obama administration had expected. “Scalia was such an important member of the Supreme Court,” stated Obama. “We’ve found a few people who we think can handle the job, but unfortunately nobody who can fill the seat. We’re going to have to go back to the drawing board with this one.” Obama reportedly visited the Supreme Court Building after his speech to see if he could fill the seat, but his lean build and 180-pound weight were clear indicators that it was not meant to be. Scalia’s death has taken a toll on not only President Obama, but on the other Justices as well. Justice John Roberts was reportedly “not sure how the court could move on without ole Fat Tony,” while Justice Sonia Sotomayor expressed concerns over whose hugs would now engulf her when she was feeling down. The Flipside reached out to Justice Ruth Bader Ginsburg for comment, but Ginsburg has allegedly not been seen since climbing onto Scalia’s empty seat and not being able to find her way off.